Created in collaboration with Sean Durham, Ryan Reposar, Paul Pangaro, and Nathan Felde. This model is built on the idea that innovation is about changing paradigms. The model situates innovation between two conventions. Innovations transform old into new. It is a process—a process in which insight inspires change and creates value. Read the Interactions Magazine Article which explains the process of creating the map. 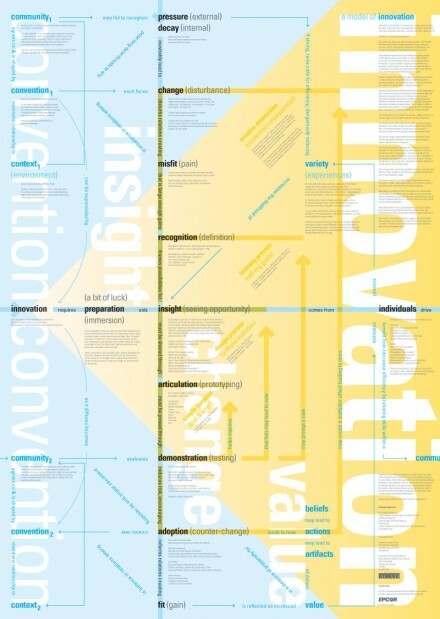 See also our collection of Innovation Models. I found this a fascinating concept map and a great start to the principles of identifying an innovation process. I’ve spoken to a number of groups about this and observed a common behaviour occurs: The groups invariably try and use the concept map to ‘build a process’ into their ‘organisations’. They seem to miss the point that it’s more an observation of behaviour rather than a road map to a culture of innovation. I wouldn’t argue that it couldn’t be used that way but the idea of formulating a constraining process to foster innovation makes me smile. It feels like one of life’s rare ironies. Wondering what you mean by insight? Classic, think u can get this into the canon in the academia?? i’d wished somebody captured it all in a bird-eye view sort of manner back in the 1990s..
Tks Paul Pangaro and DDO! We’ve been following Paul’s work and this graph is very inspiring for our work in Brazil. Luciana. Thank you for sharing your work! I am a cartographer who always looks to graphic design for clarify and methods, and your work really helps. I love your mind maps!